The Revolution Will Not Be Microwaved (2006), by Sandor Ellix Katz, is a book from a time before "food sustainability" was a mainstream conversation in the United States. This book fundamentally changed my outlook, not just on food, but on life. There are many lists of "Great Books" out there, but this one is mine. These are books that have changed my thinking the most; have opened me to new ways of thinking; have framed important problems better than I've heard them framed before; or they're simply books that I want to share widely. And a nice photo essay/recipe! If you have questions about any of this, please ask in the comments section below! I'll be speaking at the Take Back Your Health Conference in Pasadena on May 19-20. There are too many interesting things happening for me to list here. Do check out the page if you're curious. There's a special sale going on today, so you can save a few dollars! Mexico Retreat! And Predictions for 2018! First, my coauthor Raquel and I are hosting a Fermented Residency in Monterrey, Mexico, from April 21–22, 2018. You can work side-by-side with us, together fermenting everything we can get our hands on. Also a chance to experience the Monterrey area, and taste some local food and drink, including the legendary pulque. Space is quite limited, and we expect it to fill up. Greater kombucha variety! In particular, 2018 will be the year that high-alcohol kombucha makes a name for itself as a healthy, gluten-free, low-carb, and delicious alternative to beer. Also, the smaller, regional kombucha brands will continue to grow in importance, providing more options to kombucha drinkers. More natural wines and beers. Biodynamic wines, natural wines, unfiltered beers and wines, sour beers, and so on will continue to grow in popularity. Super-bitter IPAs, super-oaky Chardonnays, and massive red Zins have lost their novelty, for me and I suspect for others. When I have a glass of something, I now prefer something a little less engineered, a little lower-alcohol, a little less predictable, and a little funky. More mainstream rejection of the low-fat diet, the cholesterol scare, statins, and other health ideas based on outdated, incomplete, or bad science. Continued increasing interest in the human gut microbiome, and how it relates to not only digestive health, but also the health of the immune system, the nervous system, and other major systems in the body. Continued consumer demand for more–naturally produced food from mainstream sources, including mid-tier and even fast-food restaurants; markets and supermarkets; and school lunches. Better to be part of the control group rather than the experiment group. Health coaching. Health coaches can help us identify and deal with chronic health issues of all sorts and severities, and help us navigate the various health care resources at our disposal, as well as the bewildering array of specialized diets that claim to be able to cure our ills. In many cases, changes in diet and lifestyle can address underlying causes, while many sorts of pharmaceuticals only aim to blunt symptoms. October 26 – 29 2018: Congreso de Fermentación Oaxaca 2018 in Oaxaca, Mexico. 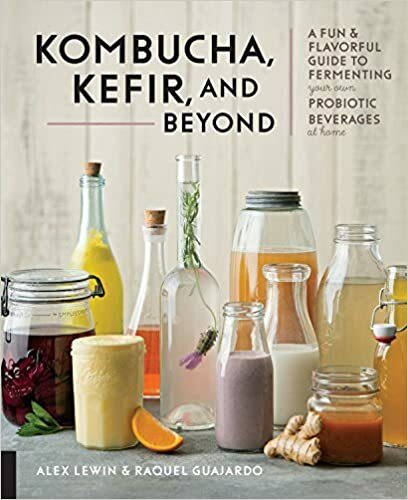 Buy Kombucha Kefir and Beyond! 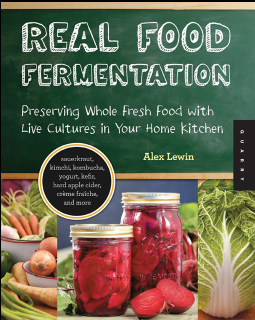 Click here to see interviews, reviews, and mentions of Real Food Fermentation. Milk in the Raw – Okay or No Whey? Click here for the Sustainable Food Book Club reading list. Nutrition and Physical Degeneration, by Weston A. Price: Rather that theorizing abstractly about human nutrition, the author sought out isolated groups of healthy people around the world (this was in the 1930s, when there were still isolated groups of people), and documented their foodways. Price's book is jaw-dropping (literally). He describes group after group of people who are healthy in isolation, and become sick, miserable, and toothless when they adopt a "modern" diet. Aren't you curious what they were eating when they were healthy? Full write-up coming soon. The Raw Milk Revolution: Behind America's Emerging Battle Over Food Rights, by David E. Gumpert: Is the government engaged in a covert and illegal campaign to discourage people from making their own food choices? Read the facts and decide for yourself. Full review here. Japanese Cooking: A Simple Art, by Shizuo Tsuji and Yoshiki Tsuji: A masterwork on the subject of Japanese cuisine, and by extension, Japanese culture. Winning Bicycle Racing, by Jack Simes: A short, fascinating book on the subject of bicycling, published in 1976, when the majority of men still wore moustaches. And as with any bicycling publication, there are some great facial expressions. The Secret History of the World: As Laid Down by the Secret Societies, by Mark Booth: A truly fascinating, meticulously documented look at the evolution of human consciousness and religion. What are some of the connections among different religions' creation myths and pantheons? Why are there astrological and other "pagan" symbols in Christian rites? Did you know that "elohim", the Hebrew word in Genesis typically translated as "God", is actually a plural noun? And so on. N.B. : the book describes an almost exclusively male experience. I think Booth could have done more in the front material to explain this, or at least to notify the reader of the orientation. The Sushi Economy: Globalization and the Making of a Modern Delicacy, by Sasha Issenberg: The history of sushi and the sushi supply chain, detailing the journey that your fish takes from the cold ocean to your neighborhood sushi bar, often by way of Tokyo. 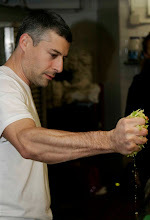 Sasha Issenberg focuses on the lives of the people involved in the sushi trade. Fascinating and well-written. The Story of Sushi: An Unlikely Saga of Raw Fish and Rice, by Trevor Corson: The story of some students at a sushi academy—and more generally, the story of sushi itself. A wonderful book, entertaining, thorougly and carefully researched, and instructive. It makes me want to eat sushi. Or write about it. Similar, but only a bit, to The Making of a Chef, by Michael Ruhlman. Putting Food By, by Janet Greene, Ruth Hertzberg, and Beatrice Vaughan: A classic work on the subject of food preserving, with an emphasis on canning. ServSafe CourseBook with Online Exam Voucher (5th Edition): You, too, can be ServSafe Certified! I am not a doctor, nor do I play one on TV. I have marketing connections to some of the brands, topics or products herein. Through the use of affiliate links contained herein, I may collect fees from purchases made.